Lighted tin soldiers guard the Poertner family Christmas tree during last year’s display. Courtesy photo. Update: The Poertner family Dec. 2 fundraiser will be moved inside to St. Brigid Hall at 309 S. Sixth St., Osage City. The dancing light display will continue 5-10 p.m. Sunday to Thursday, and 5-11 p.m. Fridays and Saturdays. With Thanksgiving under our belts, it’s time to get busy celebrating Christmas. 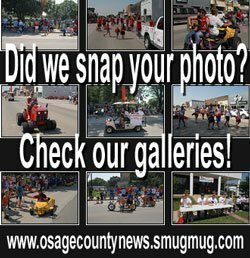 Many families decorate their homes to share holiday spirit, but some at Osage City are also using their house and yard lighting displays to collect items and funds to help others. 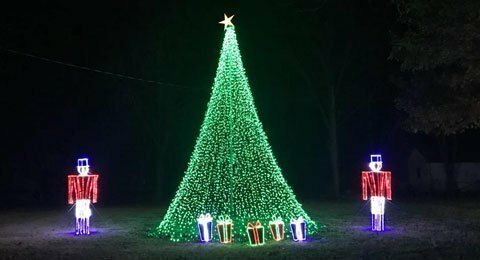 At the Poertner home, 632 California St, Osage City, a fascination with Disney lights led the family to start their annual holiday lighting display in 2012. Last year, the family added a Santa’s mailbox and had around 70 kids write letters, each of which the family answered. This year they have built a sleigh as a backdrop for photos with Santa and Mrs. Claus. As the family wanted their display to help spread goodwill, they decided to include a fundraiser – this year all donations will go to local cancer centers and their patients to provide snacks and comfort items. Donations will be accepted for photos with Santa or hot chocolate, and also T-shirts can be ordered to help out. 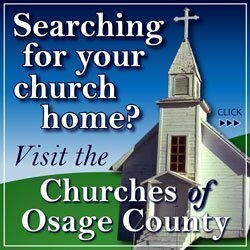 The Poertners will host an open house 12:30-3 p.m. Sunday, Dec. 2, 2018, and also invite everyone to drive by and enjoy the small town light display in Osage City with several thousands of lights dancing to Christmas songs played on 91.1 FM. As part of the Burnett family Christmas light display this year, Beth and Adam Burnett are collecting winter clothing for Help House. The clothing drive will run Dec. 1-16, 2018. They will accept new and gently used coats, hats, gloves, scarves, and boots, and other donations. All proceeds will benefit Help House. 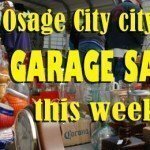 During the display and winter clothing drive, everyone is invited to come by the Burnetts’ home at 1005 N. 14th St., Osage City, and enjoy the holiday display and drop off items. The Burnett family invites all to join in the spirit of Christmas by helping someone who might need it.